We can help get your Food or Drinks labels FDA approved! As a business owner your time should be spent running your company not dealing with endless paperwork or designing labels. 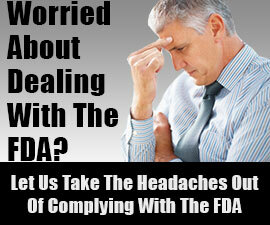 The FDA process can be complicated and sometimes frustrating. Rezzonator Services lets you focus on what matters most, operating your business, by taking care of your FDA needs. We take care of the design work and provide you with the finished product that is compliant with FDA regulations, or we can review your design and add/correct it. As FDA experts and business consultants we know that it's all about the bigger picture. Whether you're dealing with food and drinks, importing, medical devices or anything else, we are here to help your business succeed and reduce the headaches that come from getting overwhelmed by paperwork and bureaucracy. While others can talk a good game, only Rezzonator Services stands behind our paperwork with a 100% Money Back Guarantee.Call and ask about our guarantee and why working with us is the smart thing to do. Filing of Prior Notice with U.S. FDA is required before food shipments may enter the United States, including small quantities and food samples for consumption. The U.S. FDA will issue a bar-coded Prior Notice Confirmation Number that must accompany most food shipments. FDA food facility registration is required for all companies that manufacture, process, pack, or store food, beverages, or dietary supplements that may be consumed in the United States. Companies located outside the United States must also designate a U.S. Agent for FDA communications. U.S. FDA estimates that the total number of food facilities that must register with U.S. FDA is approximately 420,000, approximately half of which are domestic. As of January 14, 2009, U.S. FDA has received 518,375 registrations, of which 367,600 are foreign facilities and 150,775 are domestic facilities. The U.S. FDA requires companies that produce certain shelf-stable, aseptically-sealed low-acid canned or acidified foods to obtain a Food Canning Establishment (FCE) registration. In addition, manufacturers must file documentation with U.S. FDA for each process used in the production of foods subject to these requirements. These submissions are known as a "Process Filing" and each is assigned a unique "Submission Identifier" (SID). We create for your labels that comply with FDA policy. Call us for an estimate 855.667.7600. The U.S. Federal Food, Drug and Cosmetic Act (FFDCA) defines food 'labeling' as all labels and other written, printed, or graphic matter upon any article or any of its containers or wrappers, or accompanying such article. The term 'accompanying' is interpreted liberally to mean more than physical association with the food product. It extends to posters, tags, pamphlets, circulars, booklets, brochures, instructions, websites, etc. The Nutrition Labeling and Education Act (NLEA), which amended the FFDCA requires most foods to bear specific nutrition and ingredient labeling and requires food, beverage, and dietary supplement labels that bear nutrient content claims and certain health messages to comply with specific requirements. Furthermore, the Dietary Supplement Health and Education Act (DSHEA) amended the FFDCA, in part, by defining "dietary supplements," adding specific labeling requirements for dietary supplements, and providing for optional labeling statements. We will work with you in order to meet the FCS regulations and provide detailed reports if necessary. Food Packaging, Cookware, Tableware, etc. Food Processing Equipment, Production Aids, Sanitizers, etc. Chemicals used as Adhesives, Lubricants, Coatings, etc. The U.S. FDA requires that all FCS products are determined safe for their intended use before they are permitted for sale in the United States. Safety is dictated by the regulatory status of each component that comprises the FCS. New components and uses of FCS products require premarket notification to the U.S. FDA prior to marketing in the United States. The determination of how an FCS is regulated depends on its chemical composition. It is the responsibility of the FCS manufacturer to ensure that food contact materials comply with the specifications and limitations in all applicable authorizations. The identity, specifications, and limitations of the individual FCS components are regulated by provisions in the Code of Federal Regulations, the Federal Register, Effective Food Contact Notifications, Prior Sanctioned Letters, GRAS Notices, Threshold of Regulations Exemptions, as well as U.S. FDA enforcement actions such as import refusals, import alerts, warning letters, etc. Medical devices require clearance by the U.S. FDA before they can be sold in the United States. To obtain this clearance, companies must file an application and exhibits to demonstrate that the device is substantially equivalent to a device already legally marketed in the U.S., including substantial scientific and technical information. A 510(k) is the mechanism to clear your medical device for commercial distribution and allow the product to be marketed in the United States. We work with you to review your product and verify the structure and format of the required elements and then submit the necessary paperwork. Avoid costly mistakes or delays and let us deal with the FDA procedures and communication. We can create review your product for compliance with FDA guidelines and design compliant labels for it. Remember that it's not only important that your label looks great, but that it also complies with the FDA requirements. Our design specialists know what it takes to make an item label or packaging stand out while also being compliant with the FDA. Call us for more info at 855.667.7600. The U.S. Federal Food, Drug and Cosmetic Act (FFDCA) defines 'labeling' as all labels and other written, printed, or graphic matter upon any article or any of its containers or wrappers, or accompanying such article. The term 'accompanying' is interpreted liberally to mean more than physical association with the product. It extends to posters, tags, pamphlets, circulars, booklets, brochures, instructions, websites, etc. A Medical Device Master File (MAF) is a way to preserve trade secrets of medical device companies and their suppliers. A medical device company often needs to submit information about their supplier's product, facility or process. The MAF allows each company to submit its own confidential data to FDA without it being disclosed to anyone outside FDA. A Medical Device Master File is a submission of information to the U.S. Food and Drug Administration by the Medical Device Master File holder. A Medical Device Master File is a submission to U.S. FDA that may be used in support of premarket submissions to provide confidential detailed information about establishments, processes, or articles used in the manufacturing, processing, packaging, and storing of one or more medical devices. Registrar Corp's team of medical device regulatory experts provides guidance as to required elements, formats, and particularities of Medical Device Master File submissions. For assistance submitting a Medical Device Master File, simply click the Medical Device Master File Certificate shown on the left. We can help you by filing a new Medical Device Master File, amend or update an existing one or you can assign us as your Agent. The U.S. FDA is responsible for regulating firms who manufacture, repackage, relabel, and/or import medical devices sold in the United States. For devices that are exempt from Premarket Notification, Manufacturers (both domestic and non-U.S.) and initial distributors (importers) of medical devices must register their establishments with the U.S. FDA. All registration information must be verified annually between October 1st and December 31st of each year. In addition to registration, foreign manufacturers must also designate a U.S. Agent. Beginning October 1, 2007, most establishments are required to pay an establishment registration fee. Owners or operators of all U.S. and non-U.S. drug establishments that engage in the manufacture, preparation, propagation, compounding, or processing of drugs are required to register and submit a list of every drug in commercial distribution by way of U.S. FDA's new Electronic Drug Registration and Listing System (eDRLS). As of June 2009, all establishment registrations, drug listings, annual renewals, and updates must be submitted to U.S. FDA electronically. Establishments that were previously registered with the U.S. FDA may be able to transition their old paper filings to U.S. FDA's new Electronic Drug Registration and Listing System (eDRLS). For assistance transitioning to the U.S. FDA's new electronic drug registration and listing system, simply click the Drug Certificate of Registration shown on the left. The U.S. FDA now requires that drug labels be indexed using Extensible Markup Language (XML) in Structured Product Labeling (SPL) format. 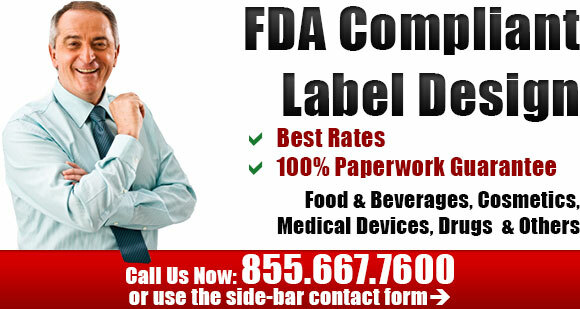 We can help modify your drug labeling to comply with U.S. FDA regulations. We can provide revised graphic files ready to be printed or edited, and a report that details the regulations, compliance guides, warning letters, import alerts, and other guidance documents from the FDA. A Drug Master File is a submission to the U.S. FDA that may be used in support of pre-market submissions to provide confidential, detailed information about facilities, processes, or articles used in the manufacturing, processing, packaging, and storing of one or more drugs. We assist companies in filings with FDA's Voluntary Cosmetic Registration Program, including establishment registration and Cosmetics Product Ingredient Statement filings. We can help by creating compliant labels for your product. Please remember that some cosmetic products may regulated as drugs within the United States.